The 2019 Hyundai Veloster is an absolute steal at $18,500 starting price. For that price, you get these standard features: two USB ports, Bluetooth, Apple CarPlay and Android Auto, six-speaker audio system, forward collision warning, automatic emergency braking, driver drowsiness monitoring, lane keep assist, rearview camera, and 7-inch touch screen. That's a fair amount of tech at a more than fair price. You can also add a six-speed automatic transmission for $1,000. The 2019 Honda Civic Hatchback starts at quite a bit higher price point: $21,450. For your money, you get standard features like four-speaker stereo, Bluetooth, USB port, 5-inch audio display screen, and a multi-angle rearview camera. There's also the standard Honda Sensing suite of active safety features, which includes automatic high beams, adaptive cruise control, lane departure warning, lane keep assist, road departure mitigation, forward collision warning, and automatic emergency braking. All told, the Hyundai Veloster offers a larger touch screen but slightly fewer safety features. In our view, the Veloster offers more bang for your buck. One of the reasons to buy a hatchback versus a sedan or coupe all that room in back. For a car this small, you really can't do better. In terms of storage space, the 2019 Hyundai Veloster has a decent amount. There's nearly 20 cubic behind the back seat, which is above average, even for a hatchback. But the Honda Civic Hatchback is a class leader, offering a whopping 25.7 cubic feet of storage space. Part of the reason the Civic offers so much more is that the Honda hatchback is far longer. The Civic's wheelbase measures two inches more than the Veloster's. Both the Veloster and Civic Hatchback can be amazingly sporty, especially their "hot hatch" trims. The Hyundai Veloster starts things off with its base 147-horsepower four-cylinder engine. Step up a trim or two and get the far more fun 201-horsepower, turbocharged four-cylinder. But neither of those compare to the performance-oriented Veloster N's 275-horsepower turbo-four engine. That won't just put a smile on your face. It'll make it permanent. The Honda Civic Hatchback also does well, with a 2.0-liter four-cylinder base engine delivering 158 horsepower. Step up to the turbocharged 1.5-liter four-cylinder engine to put out 174 horsepower. But for blistering speed, try the Civic Type R for a 306-horsepower turbocharged 2.0-liter four-cylinder. With the larger size of the Civic, we think the difference in horsepower won't really make a difference in driving, so we're calling this one a tie. Both the Veloster and Civic Hatchback can be plenty sporty. So it comes down to the other two categories. If you need a few more cubic feet of storage space, the Honda Civic Hatchback is your jam. 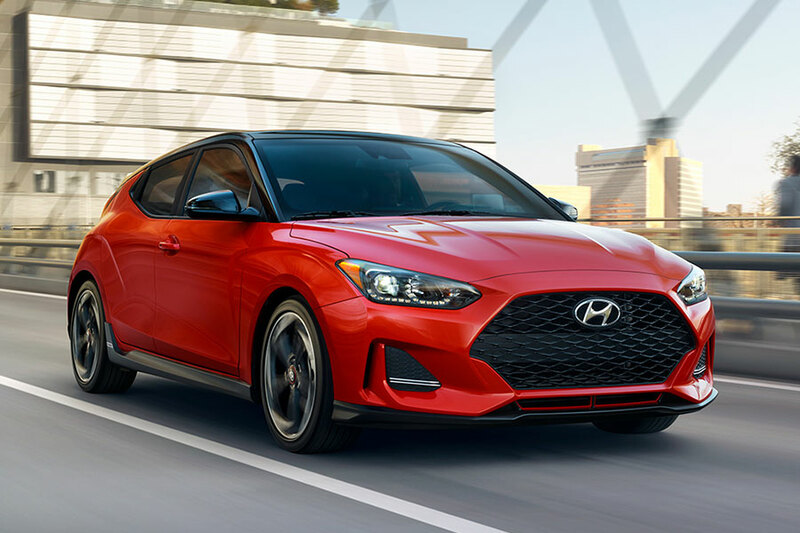 But if you value affordability more, the 2019 Hyundai Veloster might be right for you.